Warning: Some of the images in this blog post may be disturbing to some readers. One in particular shows three dead Americans soldiers on a beach, although no blood is shown and the soldiers' faces are hidden from view. The picture is necessary from an editorial sense to help readers visualize the image that the American public was exposed to. Those who may become disturbed by these images are discouraged from reading on. In Tim Hsia's article "The Uneasy Media-Militarily Relationship", he describes an incident where an embedded reporter prematurely released the identities of soldiers who were killed during an operation. That event was used as a launching pad for Hsia to discuss the relationship that embedded reporters and soldiers share and how embedded media has changed the way that war is covered. Embedded reporting is not the first new media technique to change the way war is covered by the American press. The introduction of television broadcasts and 24-hour news affected the coverage of the Vietnam War and the Gulf War, respectively. Every time a new technique of media coverage is introduced, it is certain to change the way the media reports on American conflicts. During World War I and World War II, the American media was extremely supportive of the nation's war efforts. Most Americans at the time received their news from radio broadcasts and newspapers. It was somewhat difficult for the public at large to really visualize the horror that the war had caused. Americans got their first visual sampling of just how horrifying war could be in the form of a photograph LIFE Magazine published in 1943. 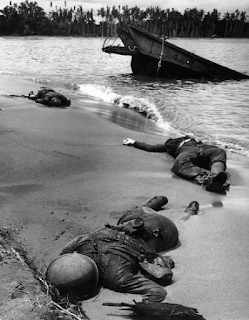 The controversial photograph showed 3 American soldiers lying dead on a beach. At the time, this image shocked the American people. However, it would end up being quite tame compared to some of the images broadcast during the Vietnam War. Although there was some coverage of World War II through the medium, the Vietnam War was the first war to be extensively covered through television. Additionally, the press experienced very few forms of censorship from the military, especially in the early days of the war. The result was the perfect formula for some of the most gruesome and horrifying images of war ever taken to be published. The public reaction to these images eclipsed anything that had come about due to the LIFE Magazine images more than 20 years prior. War had never seemed so tangible to people back home as it had after viewing the footage and images. Due to the brutal honesty of this content, the public also began to trust media coverage more than official government reports. After events like the controversial Tet Offensive, public opinion of the war began to sour. The finishing blow came when Walter Cronkite, the authority of wartime news coverage in the country, stated on air that the Vietnam War could not be won with the American troops emerging as the clear victors. Withdrawal of troops from Vietnam began roughly a year later. The Vietnam War was not the last war where increased coverage affected the outcome. Just as the use of the relatively new medium of television affected the way that the Vietnam War was covered, the Gulf War was the first to be covered by a new reporting method: 24-hour news. CNN had already been participating in 24-hour news since its inception in 1980. However, the Gulf War marked the first major American conflict since the network's founding. Therefore, it would also be the first American war to be covered through this type of reporting. The 24-hours news format allowed for the public to learn of the events as they unfolded. When a major battle of skirmish happened, Americans would learn about it right then and there. Unlike in the Vietnam War, this instantaneous coverage of wartime efforts allowed for a free-flow of information. There were also fewer discrepancies between what the government was saying and what the media was, meaning the public reaction toward the war was less negative overall. However, there was criticism on the lack of access granted to reporters during the conflict. That lack of coverage was addressed during the latest conflicts in the Middle East with the installation of embedded journalists and reporters. Embedded media presents its own form of controversy, with many questioning the objectivity of the practice. Nevertheless, it too has changed the way the media reports on wars, just as television broadcasts had done for Vietnam and 24-hour news had done for the Gulf War. As the American media changes, so does the way it reports on American wars. Does anonymity take away from the conversation? Where do user-generated news comments belong? Social Media: The New Social Forum? Who Can Get the Most Likes? Don't Do It For the Clicks.. So You Messed Up. What Now? Trusting… Clashing… What's going on?! Embedded: Land of the Free? Can Embedded Journalism be Objective? Wikipedia: To Trust or Not To Trust?